Well, this year's Carbonell's are done with, but over the next few weeks, a lot of contenders for the 34th annual awards will be opening. Mad Cat Theatre Company opens it latest offering, Broadsword, on Friday. 16 years ago, the heavy metal band BroadSword, from Rahway New Jersey, unexpectedly broke up and the 4 members went their separate ways. Now the mysterious disappearance of their lead guitarist, Richie Gomez, reunites the original band members along with the band’s biggest groupie and some creepy old guy to figure out what the hell happened to Richie. Something's Afoot opens Sunday April 12th at the Caldwell Theater. It’s a dark and stormy night, and the 10 guests of Lord Dudley Rancor discover upon their arrival that not only is the host dead, but so is his butler. A parody based on Agatha Christie’s “Ten Little Indians” (the 1939 novel also known as “And Then There Were None,”) Something’s Afoot will keep you on the edge of your seat as the determined guests unmask the murderer among them. Cagney! runs through May 3, 2009 at Florida Stage. Four out of five critics recommend it, and the fifth says you should see it anyway. Reefer Madness runs through April 12 at the Waterfront Playhouse in Key West. Jersey Boys will be rocking the Broward Center for the Performing Arts through May 3. But that's not all: the Broward Performing Arts Foundation, which funds programs at the Center, is holding a fundraiser on Saturday, April 11th: The Jersey Shore Broadway Bash. And you can have lunch with Rick Elice, one of the co-writers of the show, on Saturday, April 18th. It's Easter. No one's competing with the Easter Bunny. 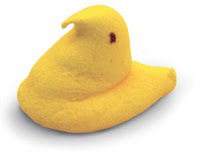 Enjoy a marshmallow peep.